Downers Grove Eye Center suggests a routine comprehensive eye examination for maintenance of good vision and ocular health. It is recommended to have a beginning eye exam at about 3 years old with a pediatric ophthalmologist, and regularly schedule exams after. The state of Illinois requires an eye exam for all kindergartners or new students entering an Illinois school for the first time. 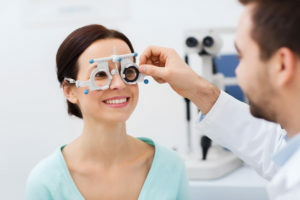 The frequency of subsequent eye exams depends on many factors, including the findings from initial exams, patient’s health history, and any significant family visual or health history. Comprehensive eye exam begins with discussion of any visual or eye problems, and a review of your overall health history. Any medications you may take will be discussed, and bringing a medication list with you is very helpful if on more than one. The testing begins with examining how your eyes are presently functioning in terms of vision, movements, function/binocularity, and neurologic integrity. As with all testing, any unusual findings may prompt further testing. Next, we examine your best vision through refraction, which determines your prescription for glasses, or contacts. Contact lenses, if desired, requires additional measurements for fit. The refraction is an important component in health assessment, and can lead to health findings also. After visual evaluation, we then examine the ocular surface of the eye with a microscope. This is to ensure the health and function of the front of the eye, and surrounding structures. Next, we would check the internal eye pressure as a screening for an eye disease called Glaucoma. This screening is very important because Glaucoma most often does not cause any symptoms until vision is lost. Early detection is very important. To complete the exam, we prefer to dilate the pupil to allow for examination of the inside of the eye with lighted scopes. Dilation provides a much more complete and detailed view inside the eye for ocular health evaluation. Your eyes do not need to be dilated at every visit, but routine dilation intervals not only offer present day evaluation but the potential to prevent future problems. As with any health testing, any unusual findings would prompt further testing to determine the cause and best solution. A complete comprehensive eye exam with dilation usually takes about 90 minutes. The side effects of dilation are light sensitivity and reduced near vision. Although this can be inconvenient for a few hours, it is a small price to pay for good vision and healthy eyes. You only get two eyes, and we would like to help you take good care of them.